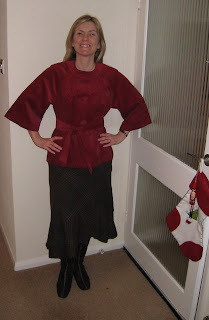 The jacket is Simplicity3631 and it is the first part of my Sewing With a Plan. I made it in a burnt red cord from Timmel Fabric. I really enjoyed sewing this pattern. I made a size 10 and the only alterations I made was to narrow the sleeves and lengthen the belt. I narrowed each front and back sleeve piece by 6 inches, that makes a whopping 12 inch off each sleeve. 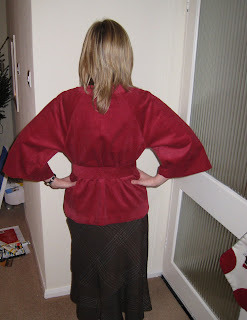 I am only 5"4 and I just felt that the extra-wide kimono sleeves would drown me. To do this I measured 6 inches in from the seam on the lower edge of the sleeve and then used the hip curve of the skirt pattern to draw the new cutting line. There are full instructions in the Sew Stylish magazine that featured this pattern. I also lengthened the belt by about 6 inches following the other reviews on Pattern Review. I am really pleased with the fit of the jacket and the modern cut and styling. If I were to make the jacket again I would do so in a more drapy fabric, and possibly try some of the variations in Sew Stylish magazine. 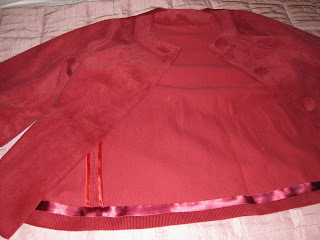 As the jacket is not lined, and I do not have an overlocker, I bound the seam allowances with satin tape. All in all, I am really pleased with my jacket and feel that I am off to a good start. It spurred me on to go shopping for the rest of my material for my plan. The mission was successful and I am going to work on my storyboard soon. Your new jacket looks great! Congratulations on a very successful start to SWAP 2008! Catherine, that jacket looks terrific - the sleeves are just wide enough to be stylish, good job! I found you at Artisan Square! Congrats on a smashing beginning for your SWAP. I'll be peeking!